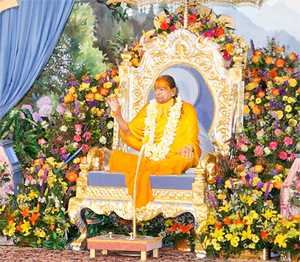 Maharajji Kripalu says that every soul in the world only wants Divine Bliss and he is trying continuously every single moment to receive that Bliss. But even after uncountable attempts since eternity, he hasn’t been able to attain even a trace of that happiness. Why does a soul desire happiness? Because he is a fraction of God, who is the form of happiness, Bliss. The souls made a mistake. We considered ourselves to be the body. Why did this happen? Because of maya. Why is maya there? Because we are facing away from God. And since when has this been? Since eternity. It didn’t happen at a particular point in time. Now what has to be done? We have to understand where is happiness and how to attain it. In other words, how do we satisfy the hunger we feel for happiness? The Ved tells us to leave all desires and become brahmbhoot, become like brahm. Become Blissful. You just have to leave your material desires! Don’t do anything else. The one who doesn’t want anything becomes like brahm. If he were to remove all desires from his heart, then he would become like God – in other words, he would become as Blissful as God. If you eliminate all your desires, all your tension and peacelessness will disappear. You will become Blissful. All the scriptures say this: leave all your material desires. If a desire comes, then all your satvik virtues go away, giving rise to negative behavior. If a desire arises, then you will do all kinds of deceptive, cunning, and wrong things to fulfill that desire. You will sin. No one is saved from this. So all the scriptures say to leave worldly desires and then your work is done. Desire spoils everything. How? A desire arose. Now you are obsessed with fulfilling it. For example, you want one million dollars. Now you are obsessed with saving money. You feel tension 24 hours a day. You might become a millionaire. If you have that much money, you will remain busy protecting it. Now your relatives will be attracted to you, “Could you please give me some?” So in its acquisition there is pain, in its protection – pain, and if it is destroyed or lost – sorrow. Each and every acquisition is like this. You want a son. You get married. Then nothing happened. Then your first child was a girl. Then your second child was a girl. Finally you also had a boy. Now you are nurturing him. He got sick. You cried, you stayed up all night. He grew up and then he said to you, “What have you done for me?” Your father and mother nurtured and raised you, explained and taught things to you. That was their duty. But this is the insult they receive in old age. If that son dies, again the parents cry. Nothing in the world is fixed or lasting. There is gain and loss, life and death, fame and anonymity. Both kinds of things happen side by side. There is no one in the world who only had gain and no loss, or who lived forever. Everyone has to die. A yogi lives to be 200 years of age, but after this he will die. People say Savitri was able to get her husband Satyavaan’s life returned by Yamraj. But where are Savitri and Satyavaan now? Which country are they in? Which district? They also died. One has to die.